Mom's Gone Bronson! 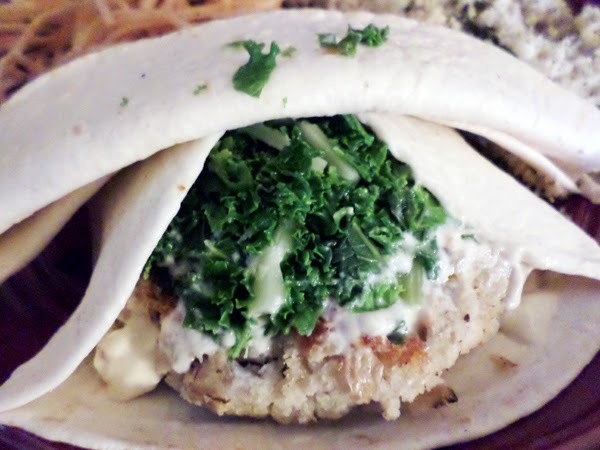 : Pot-Luck, No Measure, Bean and Greens Veggie Burgers! Pot-Luck, No Measure, Bean and Greens Veggie Burgers! Here is yet another simple [yet tasty] way to make a meal that doesn't skimp on nutrients and looks great! This is a good way to add a vegetarian option to your menu and is great for all members of the family! You can also throw these on the grill so they work for all ocassions and taste great even when cold if you wanted to take a few along to a picnic etc...very versatile! 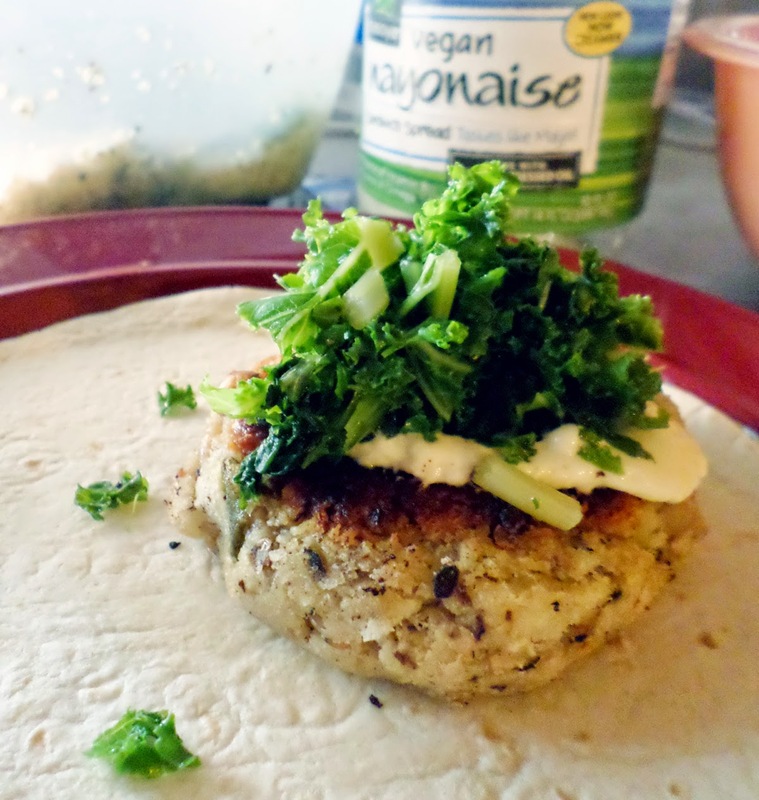 Bean and Greens Veggie Burgers! Black eyed peas or beans of your choice - washed, cooked, soft and let cool. Green beans - cooked, cooled. Bread crumbs of your choice to suit your taste! - I like japanese style bread crumbs. Salt, pepper and seasonings that you like! Sweet, leafy greans of your choice! Tortilla wraps or burger buns, whatever you prefer! First of all, you will notice that I haven't given you exact measurements! This is mostly because I don't like to measure anything too much and go by sight, experience and personal preference and I think this is a great way for you to take these recipe ideas and make them your own - so! I have given you the basics and the idea and you go with the flow and see what happens! It is fun and easy and you get what you want, not what I want! Win, win! 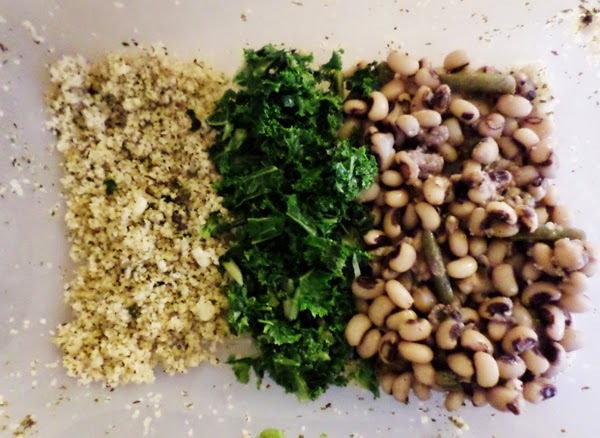 What you are going to do is take your cooked beans or peas - I like to use black eyed peas - about a cup full to start off and add to those about half a cup of green beans, which are cooked and cooled. To that, add a cup of breadcrumbs, to start - you may need more but add as you go along to get the consistency you like! Add in some salt, pepper, seasonings of your preference, to taste! Lemon pepper or paprika work well and it really is up to you! Add in some minced onions or oregano perhaps, whatever takes your fancy! You may also add a tablespoon (TBS) of mayonaise or nayonaise to help bring it all together - if you prefer to use an egg, then add an egg for glue instead, but I do not use eggs in my cooking very often! Now that all of your ingredients are in a bowl, get in there with your hands and smoosh it up and bring it all together! Don't be scared of getting dirty and don't worry about being too rough! Get all the goods together and they will start to feel more substantial - a little more plyable as a whole and you will be able to start to gauge whether you want to add more beans or breadcrumbs for a thicker "burger". Once you have a texture you are happy with, pick up a handfull of the mix and simply shape it into a burger shape! Pat it around the edges and see how you like it! If it is too wet it is going to fall apart when you cook it and so you will now want to add more breadcrums to soak up a little moisure! HOWEVER! If there are too many breadcrumbs, the mix may get a little dry and fall apart, too, so in this case, add a little more green beans, beans, peas or mayonaise/nayonaise to keep them a little moist. When you are satisfied with the way your "burger" looks you can place them on a plate and put them in the fridge, covered with a little wrap [or in a tupperware container] until you are ready to use them! They cook very well once left to settle a bit and all you need to do to cook them is a very shallow, low-heat fry or grill. Keep your eye on them, let them take a little time to cook all the way through but don't leave them so long that they burn. All cookers, ranges, tops and grills will vary so watch them as you go and find the time that suits you! I like to cook mine in a little sunflower oil or glaze them with butter and oven-bake, instead. The good thing about these patties is that everything you are using is already cooked by the time you get to warm them again in their "burger" form and so you have no fear or raw ingredients if you are not using eggs. If you DO add an egg then make sure you cook these thoroughlly once formed into patties, before serving, to avoid any kind of problems! Serve these up on a tortilla wrap with a handfull of sweet greens, spinach, lettuce or whatever you fancy and even add on a little sauce or mayonaise/nayonaise (we love it in our house, I know!) and eat on its own or with a side of salad, veggies, cous cous or whatever you fancy! Maybe even a big bowl of fries!! I put some tabouli salad with ours this time around, which is what you can see in my left-overs tub, which sets you up for a snack or sides for the next ocassion. It really is that simple - no fuss, no mess, and any ingredients you have left over can go cold into the fridge to form more later or to throw into a salad a I mentioned before! Never throw anything out unless you really have too - too much food goes to waste when it really doesn't have to - you wouldn't throw a $5 bill in the trash and so why throw away a meal that is waiting to happen? No more! Cooking doesn't always have to be stressful, so go with the flow - let me know if you try these and how you bring your own together and flavors, texture, tips etc - I would love to see more!! These are a big hit with all of our family from the baby to the "old man" and everybody always asks for more! Sure sign of a winner in our house!